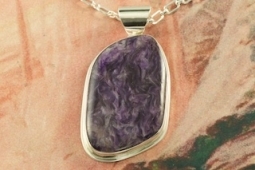 Stunning Pendant featuring Genuine Charoite set in Sterling Silver. Charoite is a Beautiful and interesting gemstone first introduced in the US around 1976. It's vivid colors range from lavender to deep chatoyant purple. It is mined in Siberia Russia near Charo River, Lake Baikal region. High grade charoite is distinguished by mixtures of deep rich purple and silky zones, in swirly and/or needle-like chatoyant patterns/sprays. Free 18" Sterling Silver Chain with Purchase of Pendant. 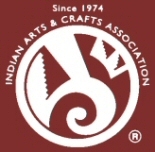 Created by Navajo Artist Joe Piaso. Signed by the artist. Pendant is 2 3/8" L x 1 1/4" W.